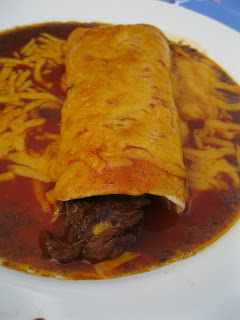 Chile Colorado is shredded beef in a mild red chile sauce This crock pot version only requires 3 ingredients into the crock pot and then tortillas and cheese to make the burritos. So easy to throw together, yet soooo yummy! I was first introduced to it from: food-pusher.blogspot.com. Once I saw her recipe I knew I had to give it a try. I found it so easy and so tasty that it is going to be a keeper for sure. I tried the recipe exactly as she posted it. It turned out great. I may try a slight change next time,just for my own personal preference, which I'll post at the end of the recipe. 1-2 cups shredded cheddar cheese. In a crock pot put meat, crumbled boullion cubes and enchilada sauce. Cook on low 6-7 hours or on high 3-4 hours till beef is fall apart tender. To assemble burritos: on an oven safe plate or even in a cake pan, place a tablespoon or two of beans on tortilla, top with desired amount of beef cubes. Roll up burrito. Place seam side down. Top with more red sauce and then cheese. Place under broiler in oven till cheese is melty. Makes 5-7 burritos depending on amount of beef used. Jan's Tip: My stew meat put out quite a bit of juice there by diluting my sauce and making it a bit runny. Also the long, slow cook time made the sauce a deeper color, not that nice bright red enchilada sauce I love. Next time I think I will add only 1/2 or 1/3 the sauce to the crockpot and save the rest for pouring over the top of the burrito fresh before broiling it. That way the beef still gets the great chile flavor, and I still get to top it off with that thick red enchilada sauce that I love. Also I may add a can of black beans to the meat while it cooks and keep the refried as a side dish with tortilla chips.